To compete within this new gig economy and combat skills and worker shortages, Talent Acquisition professionals are using more top talent from non-traditional labor pools. HR managers have begun adopting more agile talent strategies by utilizing contingent workers, freelancers, independent contractors, Statement of Work (SOW), Corp-to-Corp (C2C), moonlighters, third-party consultants, self-employed, 1099ers, human cloud workers — whatever you call them, the “gig economy” is thriving. In the last financial crisis, the landscape of American business changed dramatically. In the past, most working people wanted stability: a meaningful place to go during the day, a steady paycheck, and a sense of security. A lack of stability, aspirations to be their own boss, and desire for flexibility are what drive workers today. Millennial-focused professional online communities showcase what it means to be a self-employed young person. It turns out that the gig economy, as well as a prevalence of the side–hustle in younger professionals’ careers, is what is defining today’s freelancing economy. If these self-employed taxpayers are used to traditional employment arrangements and are new to participating in the gig economy, they may be unaware of, or confused by, all the tax requirements for self-employed individuals. With low unemployment and a flourishing economy, we need to shine a spotlight on the self-employment tax compliance requirements that companies and workers must follow. Treasury Regulations do not require certain gig economy businesses to issue Form 1099-K unless workers earn at least $20,000 and engage in at least 200 transactions annually. Consequently, many taxpayers who earn income in the gig economy do not receive a Form 1099-K; therefore, their income is not reported to the IRS. When income is not reported to the IRS, taxpayers are more likely to be noncompliant. TIGTA has recommended that the IRS take several corrective actions to improve how the IRS’s Automated Underreported (AUR) program addresses self-employment tax noncompliance, selects cases, and conducts quality reviews. TIGTA suggested that the IRS Office of Chief Counsel develop and issue guidance to help clarify current third-party reporting regulations and work with the Department of the Treasury Office of Tax Policy to pursue regulatory or legislative change to reduce the information reporting gap.TIGTA contends that the implementation of these recommendations would be in the best interest of improving taxpayer compliance. 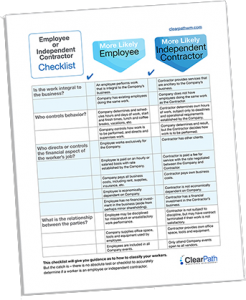 Get the benefits of engaging with Independent Contractors without the potential risks. ClearPath Workforce Management risk mitigation services bridge the gap where fear of risk may prevent engagement of top talent in the gig economy. ClearPath, ClearIC™ has incorporated industry-leading technology to automate the IC compliance evaluation process, in a program managed by our experienced compliance specialists. It marries the efficiencies of an online system to collect data and documents with the knowledge and expertise to apply rationale to the data and documents collected. You get the best of both worlds: online access to a logical, easy–to–use system, and attention to detail as well as expertise. If your organization could use some assistance navigating worker classification and IC compliance, let the experts with ClearPath assist you. Request a complimentary review of your potential risk and exposure analysis from ClearPath. This blog article is for general information purposes only and does not provide an in-depth overview of tax laws. It should not be solely relied upon or substituted for tax, legal or professional advice. Employment categories and circumstances, along with detailed provisions of these laws, must be taken into consideration. Use of the information provided is at your own risk.